How can I remember how to be a wife when it takes all I've got to be a momma? Since becoming a mom, do you ever feel like your marriage no longer receives the attention it needs to thrive? Do you ever wonder how you're supposed to re-center your heart on your husband when you are so busy with everything else? Those feelings we experienced in the first days of love and marriage often become buried beneath hurried life, active children, and mountains of bills and laundry. Maybe you've questioned and perhaps even worried if you'll ever again experience romance as you did in the beginning—that newness of what it meant to be fully caught up in one another. But what if you could rekindle that fresh sort of love? What if there was a secret to love unending? 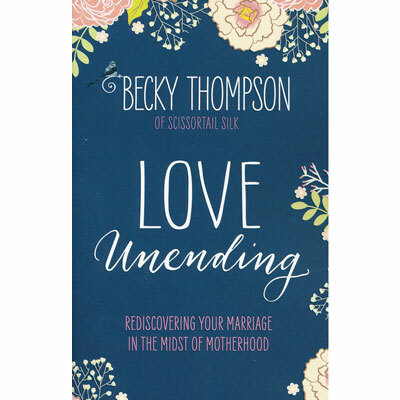 For the next twenty-one days, journey with Becky Thompson to remember what life was like when you first fell in love with your husband. Each daily challenge, reflection, and prayer will refocus your attention, re-center your heart, reignite the romance, and help you rediscover your marriage in the midst of motherhood. Becky Thompson began blogging under the name Scissortail SILK, quickly drawing a global audience of millions. A self-professed city girl, Becky is a recent transplant to northwest Oklahoma, where she lives with her husband, Jared, their three young children, and whatever critters wander in from the wheat field behind their house. You can connect with Becky online at BeckyThompson.com or join her and the thousands of other grace-filled moms who are a part of the Scissortail SILK community on Facebook.